Cats use their urine to communicate with other cats and with us. "Have you been using the litter box... or the plant?? And don't lie to me..."
"The litter box. We promised!" "We're not supposed to use the plant?" When we take animals into our hearts and into our homes, we expect them to adapt to living with humans ... to live according to our rules This is consistent with the perspective that claims we are in charge of Planet Earth and all life upon it. Those of us who choose to live with indoor cats expect them to use a litter box provided by us and maintained by us for their and our convenience. One of the most common phone calls from clients is "The Case of the Cat Who Has Stopped Using the Litter Box." After more than 10 years of talking with cats about litter-box-related behavior, I can assure you that in each instance, the cat had a good reason for its behavior, even though s/he may have been reluctant to talk about it at first. I always begin a conversation about litter boxes by explaining to the human client that not using a litter box may be a sign of urinary or other abdominal problems which should be checked out by a veterinarian. While a cat may tell me that something else is going on, it would be unwise to overlook a medical situation that could be associated with these other issues. My recommendation is that, at the first sign of spraying or defecating outside the box, take your cat to your veterinarian. When the vet has assured you that there is no physical problem we can explore other issues. Note: While some animals may tell me that they have a physical problem or I may even feel their discomfort in my own body, they may not always know what the problem is anymore than we can self-diagnose. On the other hand, some animals will deny physical discomfort because they don't like going to the see the vet. Others may be very stoic and I won't be able to sense their discomfort. It's important to remember that veterinarians play an important role in our companions' health. Why does a cat stop using the litter box when urinary or intestinal medical problems arise? Imagine that you are a cat. You are in pain when urinating or defecating (or both) or are having trouble doing so and need help. How are you going to tell your human that there is a problem? How are you going to let them know it is urgent? Missing the box is a sure-fire way to get a human's attention, at least most of the time. When you discover this behavior, anger is not an appropriate response. An appropriate response is a trip to see the Doc. OK. You've been to the vet. There is no medical problem. Now what? There are many other possibilities. For example, there was a male cat who, as a small kitten, had fit nicely into a small litter box snugged into a tiny bathroom between the toilet the wall. As an adult cat, he was now quite a bit larger and couldn't fit comfortably into the box, much less into the box in that location. I was given this information by the cat while on the phone with the human client. Once I explained to his person, she immediately acknowledged that this was the situation. The problem was solved when my client bought a larger box and put it in a place easier for the cat to access. Most cats are very clean animals and prefer a clean box, but some are fussier than others. 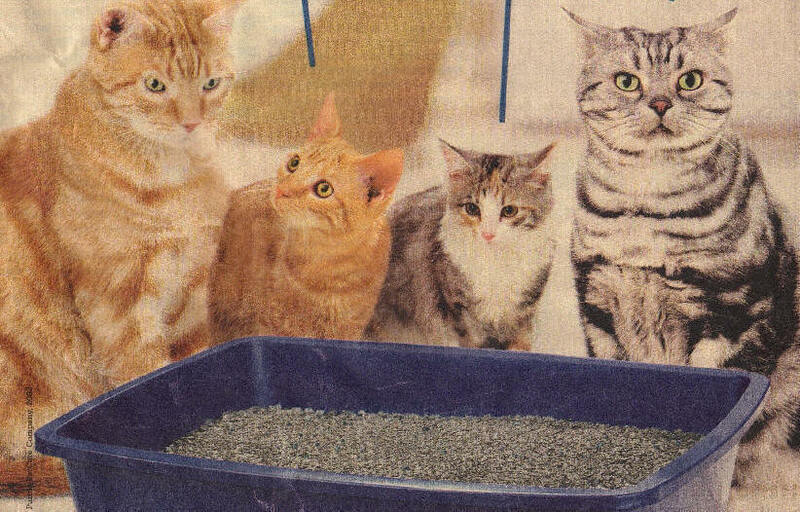 Some will share a litter box while others want one to be pristine before they will use it. However, when one cat told me the litter box wasn't cleaned often enough, the client on the phone admitted that she cleaned it only once a week. Put yourself in the cat's situation: do you flush your toilet only once a week? Would it be appealing to you to use it that way, especially if you had to stand in it? Once the human and the cat agreed to a cleaning schedule, the cat used the box consistently. Another cat told me that "the litter stinks". The human was cleaning the box twice a day. What was the cat objecting to? The litter was perfumed, which was OK for the human's nose, but offended the cat's. Not liking the scent of the litter, the cat stopped using the box. Remember, cats get the artificial perfume scent from the litter on their fur and then have to lick themselves clean with their tongues. Still another feline, who had been declawed, suffered "phantom limb" pain in her front feet and disliked the gravel litter her human had chosen. I suggested several softer brands for them to try out. With a little experimentation, the cat returned to using her litter box consistently. Cats in the wild use urine to mark territory. Understanding the underlying message (protection and/or setting territorial boundaries) may reveal some powerful aspects of the wild that are still strongly imprinted in the so-called "domesticated" feline. Sometimes a compromise can be reached, but creative brain-storming sessions may be required. Finally, cats may express emotion by spraying. Cat's can be "pissed off," literally. They can also "sh--t" literally. They may express fear, anxiety, jealousy, or other emotions by spraying or leaving their poop around the house. When this is the case, the situation may be quite complex. A family dynamic can be in play which may include other humans and animals. Telling the cat s/he will be thrown out or threats of any kind usually do not work in this situation. Instead, this is an opportunity for taking a look at one's own life to understand how the cat's behavior is reflecting some inner dynamic in the human family members. As you can tell by now, when cats stop using the litter box the underlying reason can be simple or complex. Listening to what the cat has to say is often the best way to address the situation. After all, our animals are with us a for a variety of reasons beyond our notion that we have chosen to have them in our lives. p.s. I recommend addressing this behavior right away and not letting it go on for any length of time. If your cat has been spraying for years, there is now the additional issue of breaking a long term habit.